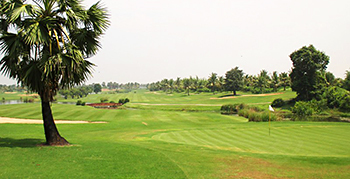 Located to the west of the famous Angkor Wat temple complex, the new 18-hole championship course at Phokeethra Country Club has already made a big impression on the Asian Tour, hosting the Cambodian Open in 2007, the year it opened for play. Phokeethra’s sweeping, tree-lined fairways are routed around natural lakes and streams – all but one hole features water – and the course ends with the signature double water carry 18th which demands a formidable final shot into a tough island green. Look out for the 11th century “Roluh” bridge between the 18th green and the 1st tee, linking the club to Cambodia’s ancient Khmer Empire. If you want to play the course as if you were competing in the Cambodian Open, just like the pros, you now can, as the two nines have recently been switched as part of a refurbishment project. With flat terrain the designer has used the assets he was given – water and trees – to fashion a challenging layout. Every hole bar one features at least one water hazard, sometimes two... The holes holes are framed by the natural vegetation and are also well bunkered. Most of the green complexes are raised and protected by both sand and water. Perhaps it was the humidity, but I also thought the course played longer than the card suggested- it is a course where carry is a key factor. Most people head to Siem Reap to see the temples at Angkor Wat – a UNESCO world Heritage site. They really are special. But if you want to play some golf whilst there, Phokeethra CC is a course you absolutely should add to your itinerary. This place is a ridiculously overpriced joke. I say this as someone who has now played golf in 40 countries, so I like to think I know what I'm talking about. For much of my time at Phokeethra I had nothing but contempt for the place and would have rated it a 'one', but they did do a bit of service recovery at the end and I was placated a little. (but more about that later) The marketing folks are still trading on the fact that they paid for an Asian Tour championship game at this course between 2007-2010, but it must have gone downhill significantly since then. From the top. USD120 green fee and then a compulsory USD40 caddy/cart fee. Green fees I can cop as that's the cost of the game, but $120 is a lot and for that I have high expectations. Also, don't foist a useless caddy on me when I can do all of that myself. Not the ladies fault, but she spoke rudimentary English only and couldn't answer anything but the simplest queries about the course. What hazards are over the back of that green? How far right can I go on this fairway before the line of the water hazard? Both questions were too difficult. So someone raked some bunkers and handed me clubs when I was standing right beside my bag and could have pulled them myself. As I said, not her fault, just a pointless cost. Personally, I would pay USD50 for this course for what I'd see as fair value. Or to use a different comparison: Phokeethra are asking the same as what I paid to play the Old Course at St. Andrews! There was probably 10 times the number of staff to the number of golfers, so it looked pretty, but that only takes you so far when the product you're selling is flawed. And another thing. Small bottle of water in pretty much any shop in Siem Reap: 30cents. Here they want $4.50 for it. Memo to management: under-promise and over-deliver, not the other way around! For USD120 you can provide bottles of cold water in the heat! Phokeethra Country Club is a flat course with water on every hole except for one. The fairways are relatively generous, thus no big pressures off the tees but approach shots are demanding as most greens are elevated and guarded by deep bunkers or/and water hazards. Many greens aren’t deep, so your skills to hit the ball onto the greens with irons and fairway woods are tested. The four holes from 15th on 18th are called “Phokeethra Corner” as challenging holes continue. For four years through to 2010 it staged the Asia PGA tour event Johnnie Walker Classic Cambodia Open. The par 4 431-yard 16th consists of a dogleg to the left. The tee shot is over a creek requiring a 210-yard carry and accuracy as the fairway is surrounded by water. There is another fairway on the left, separated by the creek, reachable 260 yards from the tee but it is narrower and so the right island fairway is recommended. The second shot is over water, too. The green is shallow and slopes to left. A bunker guarding the front of the green is in play. The par 5 608-yard 18th is a challenging signature hole that is almost straight, requiring a double water carry. The fairway off the tee is narrow with a lake along the right. The double fairways are provided right & left. On the second shot and you must make a decision whether to go for the right fairway across the water or lay-up safely short of the water onto the left fairway. If you decide to lay-up, the third shot is over the water to the elevated green. The green is wide with ridge in the center. The sharp slope divides the green in half. To read more about Phokeethra Country Club, click here to visit my website.